Often, we can find ourselves in an armchair that isn’t suitable for long periods of sitting because they are based on appearances rather than functionality. In many cases, the height and depth of the sofa or armchair is not accurate for those using them for many reasons, such as them being too narrow or too wide or because the furniture is old and used. This can then affect our posture and muscle function and cause a decline in the speed our bodies move at. Sometimes we tend to sit in positions that are technically ‘wrong’ for us and this can then quickly become uncomfortable and cause our joints to stiffen or cramp, making it harder for us to potentially get out of our chairs or too even just sit in them for long periods of time. There are important features to be looking for when shopping for a new armchair. The height is important as a higher seat can make it simpler to get in and out of. But you don’t want it too high that your feet are unable to reach the ground which can cause pressure on the back of your thighs, making it uncomfortable. Our Riser Recliners are the perfect answer for these situations. They are ideal for individuals who have restricted mobility from the likes of arthritis, rheumatism or MS. The Riser Recliners will gently guide you into a sitting or standing position by using either a single motor motion or a dual motor motion. A single-motor riser recliner, has just one motor which controls all the electric functions on the chair. The backrest, footrest, and riser functions are all operated through a single set of buttons. The backrest can be put into a fully reclined position while the footrest will be raised giving you a complete relaxed situation all from the push of a single button. By pressing the rise button, the chair will move into a raised sit-to-stand position. The backrest will rise while the footrest drops and then the whole chair will rise to aid you into a standing position. The single-motor rise and recline chairs are low-priced and are easier to operate with the simplicity of their controls. A dual-motor riser recliner is a chair controlled by two motors; one motor operates the backrest whilst the other motor operates the footrest and riser function. The dual motor’s handset control has four buttons on it, with each set controlling one of the motors. With these extra buttons, the recliners offer more seating positions with the flexibility of the backrest on one set of controlled buttons, while the footrest can also be adjusted to suit the individual using a different button. Our Orthopaedic High Back Chairs can ensure your Mam or Dad holds a correct sitting posture in a fireside style chair. These seats are designed to provide lumbar support and the firm cushions offer lower back care. The arm rests come in cushioned support or polyurethane to optimise the comfort. The Orthopaedic chairs can differ from the common fireside chairs as they obtain a stable, upright position for the user which reduces the pressure that is put on their bones and muscles. Some of the chairs will offer adjustable heights to minimise the efforts of rising from your parents which is ideal if the user is recovering from hip or knee surgery. Many people who are in a sitting position for a prolonged period of time can suffer from pressure sores or can be recovering from pressure sores and may require a pressure cushion to assist with the healing of the sores or to prevent sores from occurring in the future. These pressure sores, also known as pressure ulcers or bedsores are a type of injury that affects areas of the skin and underlying tissue. They can develop when a large amount of pressure is applied to an area of skin over a short period of time or when less pressure is applied but over a longer period. The pressure disrupts the flow of blood through the skin and without a blood supply, the affected area of skin becomes starved of oxygen and nutrients. As a result, it begins to break down and this leads to the formation of an ulcer. A pressure cushion is ideal for people suffering with these sores and there are several types of pressure cushions available. They range from basic foam to alternating air cushions. A healthcare professional can help to determine which type of cushion is best for the level of bed sores an individual is suffering or recovering from. 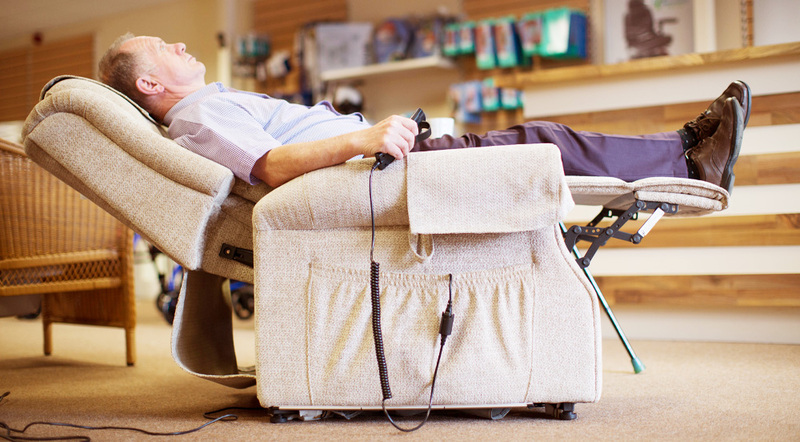 Whilst riser recliners and orthopaedic chairs are designed to minimise pressure, they may not offer enough pressure relief for a pressure sore and a pressure cushion may also be required. If your Mum or Dad are having problems sitting in an upright position, a specialised foot stool or foot rest can help decrease the chances of circulation problems for them. A static foot rest offers raised support to the calves while in a seated position and allows for the even distribution of pressure along the leg. This reduces the chances of stiffness, cramps and the development of pressure sores. These foot rests are both height and angle adjustable to ensure that both the thighs and calves are supported correctly on the seat and offer flexibility to cater for people with fixed postural problems of the ankle. In the situation where your Mam and Dad may be dependent on assistance due to severe limited mobility, a Portering Chair may be beneficial to their daily living. These chairs offer similar benefits to a rise recliner in the instance they can be manually tilted forward/backwards to help with their rising. The added bonus of these chairs is that they are mobile and be easily transported to move your Mam or Dad to different rooms in the house. They also come with a head rest and elevating foot rest to add extra support and stability for them. We at Beechfield Healthcare, always advise that you seek the input of a medical clinician such as an occupational therapist to help inform you of the short and long term needs of your Mam or Dad when purchasing our products, so you can receive the maximum value and support from them.